I certainly opened a can of worms, at least for myself, when I started reading about Forestiera species. I had learned about F. neomexicana (New Mexico Olive) when I worked in the nursery trade in northern New Mexico in the early 80’s. A few years later and back working in nurseries in the Tucson area I saw F. phillyreiodes (Desert Olive) in the Kofa mountains of southwestern Arizona. Both botanical names have since changed, but, of course, the plants haven’t. More and more I don’t get worked up about changing botanical names, as searching out the old and new names is sort of fun. And though on line searches are usually the most up to date, I never tire of having a pile of open books in front of me as I scour the pages for plant stories and botanical tidbits. For example, there are 15 species of Forestiera found in North and Central America…that could change at any minute. And there are 6 species found in Texas. Whoa! But hey, it’s a huge state. Anyway, 2 species in Arizona and undoubtedly the species Forestiera shrevei is found south of the border. I hope that is a “duh”. Did I tell you it is in the Olive Family, Oleaceae? Now I have and all our native ash trees are in that family, as well as some of my favorite wild flowers of the genus Menodora. A couple notes: no photos of Forestiera pubescens, as my photos were poor at best, but please go on line to see it. I can tell you it is beautiful leafed out or laden in the small dark purple fruit, but also the naked wintry branches and stems are sculptural and to die for. And finally; the photo of me (lucky you!) was taken by my friend Brigitte Thum at the KXCI studios. As you can see I’m about to shout, “Gimme a K, Gimme an X, And gimme a C and an I !! What does that spell?! 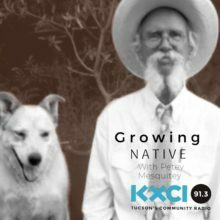 KXCI!!! Yay!